David Willey to play for Perth Scorchers in the BBL 07- The former Northamptonshire all-rounder, David Willey who made his presence felt in his first season, has been granted permission to give a miss the England Lions tour of the UAE in December-January to play for the Perth Scorchers in the ensuing Big Bash League 2017-18 in Australia. 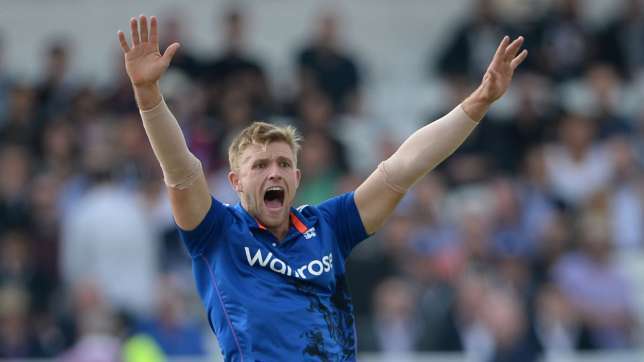 As per the formal announcement made by the England and Wales Cricket Board, the Yorkshire all-rounder will be very much available for the Big Bash till January 24, giving Lions Tour a miss. However, the move made by the ECB this time is seen as a significant departure from its earlier strict stand on foreign Twenty 20 leagues. The entire England management team is of the view that David Willey has to learn a lot from the full winter league, especially in the wake of the World Twenty 20 that is scheduled to be held in March and April 2017. Wiley will be playing the full Big Bash schedule for the Scorchers, that is all set to start against the Adelaide Strikers from the third week of December. The last match of the league will be played on January 24. And this is the reason why he has been withdrawn from the England Lions Twenty 20 squad. However, he will be very much available for the Lions five matches’ one day series against Pakistan A in January, next year. England’s director of cricket, Andrew Strauss recently opined that it will be an excellent opportunity for David. According to Strauss, it will be the ideal preparation for him leading to the ICC T20 World cup in India that is scheduled to be held in India. No doubt, playing in the Big Bash League will provide him the ample chance to focus on the T20 format for an extended period of time and hone his skills accordingly.